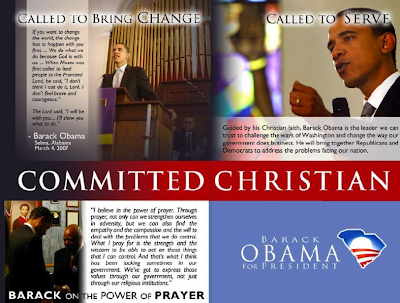 Barack Obama: "Committed Christian -- Called to Bring Change"
Are there differences between Mike Huckabee's and Barack Obama's overt political appeals as Christians? 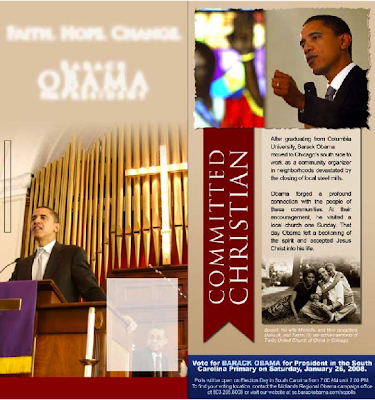 Today, Greg Sargent posted a brochure which the Obama campaign is distributing in South Carolina which seem to include religious appeals at least as overt and explicit as anything Huckabee has done. 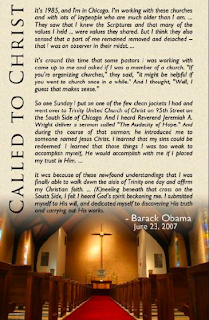 The center page of the brochure proclaims -- in the largest letters on the page -- that Obama is a "COMMITTED CHRISTIAN," and includes three pictures of Obama, all of which show him praying or preaching in a Church, and also includes a fourth picture: of the interior of a Church with a large cross lurking in the background. The page also says that Obama is "guided by his Christian faith" and quotes Obama saying: "We do what we do because God is with us." Sargent speculates that the brochure is an attempt to counter the false whispering campaign increasingly being circulated in South Carolina (by whom, we should find out) that Obama is a Muslim. That very well may be, but the brochure seems designed with a far broader purpose: namely, to signify to South Carolina's many Christian voters that Obama is one of them and therefore should have their vote for President, much the way that Huckabee sought to court the evangelical vote that was so critical to the GOP Iowa caucus. Leave aside whether what Huckabee and/or Obama are doing is inappropriate or not. Given how much religion has been infused into our politics, especially our Republican politics, I didn't really think that anything Huckabee was doing was particularly unusual. It seems more like a mild, natural extension of the direction in which we've been headed for some time. That, for the moment, is not the issue. Clearly, there are major differences between Huckabee's views on the role of religion in government and Obama's, as evidenced most recently by Huckabee's call for the Constitution to be amended to comport with God's will on abortion and homosexuality. Obama has no such positions (and I agree with both Pam Spaulding and Andrew Sullivan that Obama's speech yesterday at Ebenezer Baptist Church was courageous and, in several important respects, admirable in the extreme). But in terms of the propriety of their religious appeals for votes, is there really any meaningful difference between the two campaigns? 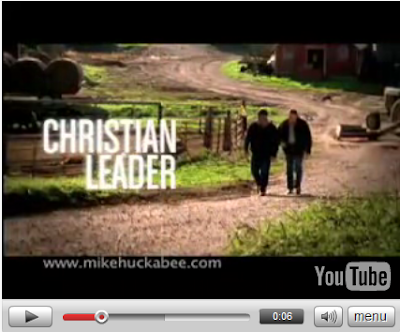 Is it possible to criticize Huckabee for inappropriately exploiting his status in Iowa as a "Christian leader" -- as many, many people did -- while believing that Obama's hailing of himself in South Carolina as a "Committed Christian" is perfectly fine? What's the difference? UPDATE: For all those angrily objecting to the notion that Huckabee and Obama are the same: nobody is arguing that they are. At least I'm not arguing that, as I think I made quite clear. UPDATE II: Hordes of Obama supporters are claiming in comments and elsewhere that this brochure was nothing more than a perfectly innocent attempt to counter the whispering campaign that Obama is a Muslim. As I indicated, I think that probably is one of the purposes, although there would seem to be lots of other ways to do that other than by creating something this overt. If Obama supporters are really intent on denying that part of the purpose here is to appeal to Christain voters by emphasizing Obama's "COMMITTED CHRISTIANITY," I suppose there is no way to persuade anyone otherwise. Finally, just to underscore the point (again), I'm not arguing that Obama has done anything wrong here. As I said, I thought much of the criticism of Huckabee for making overt religious appeals was overblown because that's become the norm for our political culture. My point is simply that, with regard to this specific tactic of appealing to voters based on shared religious beliefs, Huckabee and Obama seem to be engaged in more or less the same exercise, and therefore, it's irrational to criticize one while defending the other. Atrios makes the same point in a slightly different way.